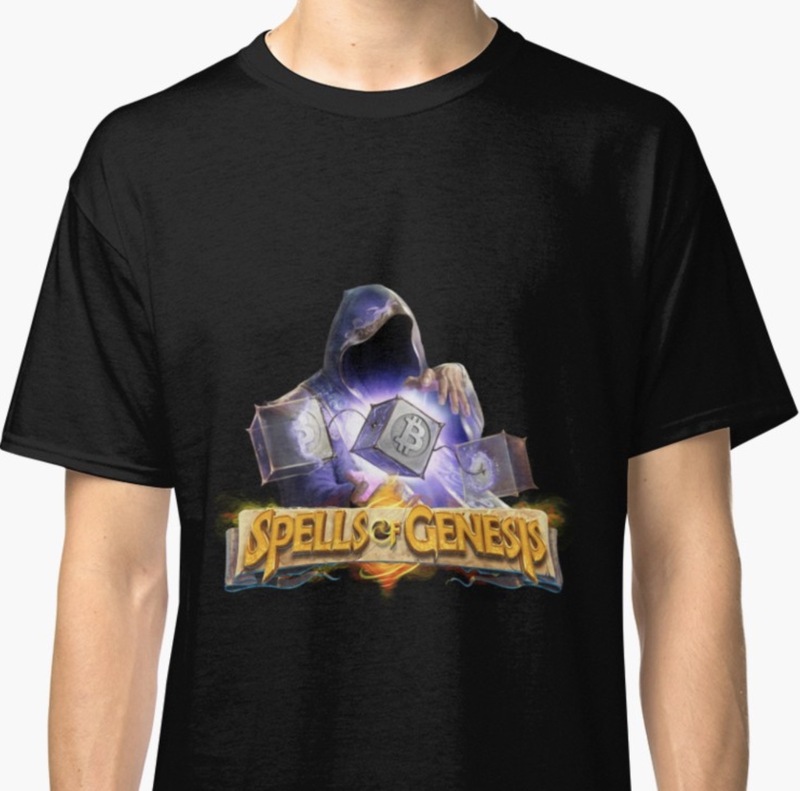 Recently we conducted a Spells of Genesis satisfaction survey aiming at gathering your opinions about different aspects of the project. Almost 200 of you took the survey and you provided us with a very valuable feedback. We have analyzed your responses and we would like to share the results with you. 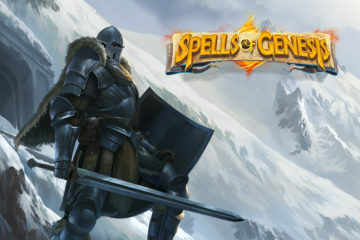 The survey results will be further used to improve the game and to make the project live up to our users’ expectations. Over 70% of the respondents consider the gameplay very important and it is rather important according to 20%. 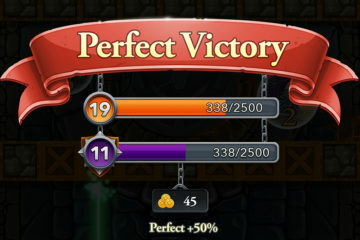 The gameplay is recognized as the most important aspect of the game. Many respondents see it as the basis needed to develop other aspects (blockchain integration, visuals, …) and to enhance them. The main aspects to be improved are the tutorial and the PvP. Players find the gameplay a bit too complicated, not intuitive and therefore they’re asking for a more detailed tutorial. The tutorial also lacks a cards dedicated part. The current Raid system is not considered as a real PvP and players are asking for a multiplayer integration. Some respondents also mention that the game is loading too slowly or that it freezes too often. Overall the respondents are very satisfied (over 20%) or rather satisfied (over 30%) with the gameplay. 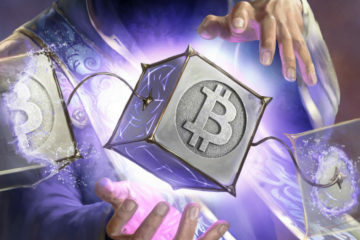 The blockchain aspects (blockchain cards, blockchainization,…) are considered as the main USP, although some referees would like to see BitCrystals more integrated in the gameplay. Almost 30% of the referees are neither satisfied nor unsatisfied or don’t have a clear opinion about the game (note 3). The visual aspects are mostly considered very important (30%) or rather important (nearly 40%). Over 45% of the respondents are rather satisfied and 20% are very satisfied with the visual aspects of the game. Some players want the cards to be more visible in the game, the cards are also the most appreciated part of the visuals. The BCY price is seen as very or rather important by 50% of the respondents (over 25% have no clear opinion). About 25% are rather unsatisfied with the price, which is the highest score of dissatisfaction among all the topics in our survey. Over 30% are rather satisfied or very satisfied and about 40% don’t know or are neither satisfied or unsatisfied. Almost 40% consider the possibility of buying blockchain cards very important and over 30% see it as rather important, but only 25% are very satisfied and over 10% rather satisfied with it. Over 40% give the note 3. Players are mostly dissatisfied with the high fees and long transaction deadlines. 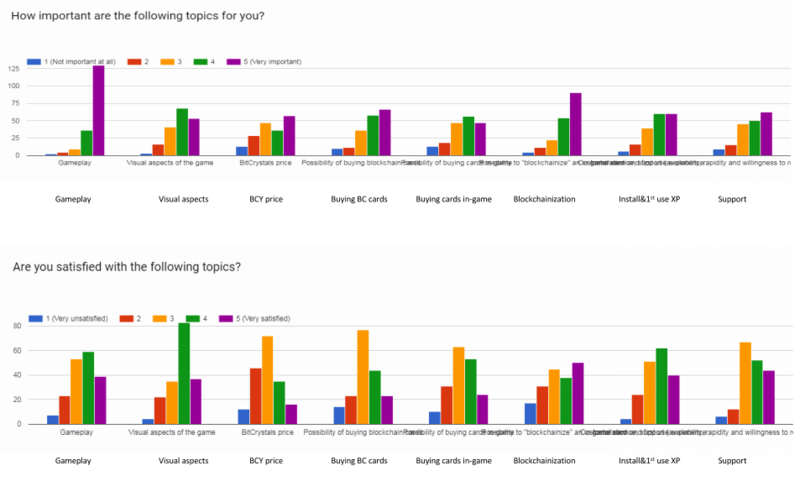 Nearly 60% of the referees consider the possibility of buying cards in-game very or rather important. About 30% are also rather satisfied with it, while 18% are rather unhappy about it (without giving any specific reasons) and 35 % don’t have clear opinion. For 50% of the referees the possibility to blockchainize an in-game card is very important and about 30% sees it as rather important. Although the bugs related to the blockchainization are often mentioned, only 15% of them are rather or very unsatisfied with it. Almost 30% of the respondents are very satisfied and over 20% rather satisfied. The installation and first use experience are very important for over 30% of the respondents and the same number of referees see it as rather important. Almost 60% are rather or very satisfied with it, almost 30% have no clear opinion. The customer service is considered very important by 35% of the referees and rather important by almost 30%. ¼ of the respondents are very satisfied and nearly 30% are rather satisfied with the support. Almost 40% have no clear opinion, mostly because they have never been in touch with our support. The second part of the survey was focused on the overall cleints’ satisfaction. About 55% of the referees are rather (40%) or very satisfied (15%). Almost 70% would definitely (30%) or rather recommend (almost 40%) SoG to a friend, while about 12% would certainly (2%) or rather (10%) would not recommend SoG to a friend. About 10% of the respondents are rather unsatisfied and 4% very unsatisfied and 30% are neither satisfied nor dissatisfied. Among the most often criticized aspects we find the lack of the synchronous PvP, too many bugs, too complicated system of buying/selling cards or high fees. 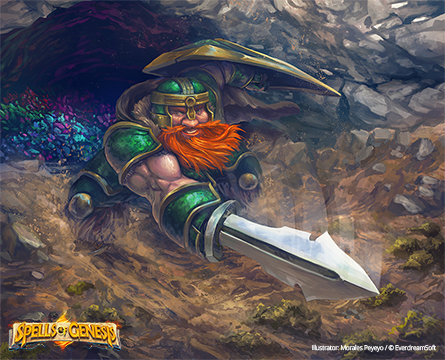 Some also think that evolving and fusing in-game cards is too expensive and/or time consuming and some players would like to see more competitive aspects – bonuses, quests, rounds and in-game and BCY rewards. Also the blockchain integration is considered as insufficient (SoG-BoO-sogassets or something similar not fully integrated). What is the most appreciated is the blockchain aspect of the game. Only about 20% of all the respondents are participants of the BitCrystals Token Sale, which probably means that our main public has changed since then. Almost 100% of the survey participants are SoG players (have provided us with their username) and about 95% have linked their digital wallet (overall the blockchain conversion is only about 20%). The latter may explain the importance given to the possibility of buying blockchain cards and of the blockchainization. We are happy that the overall results are rather positive and we thank you for your honest feedback. The gameplay is definitely the most important aspect and we can see that there still are a few details to be improved or added. Therefore we will mostly focus on enhancing the gameplay itself, which will allow us to further build on it. Regarding the visual aspects of the game, we’re doing rather well, nevertheless we hear some players’ concerns about the cards display. We’re already working on new card layers and we hope to be able to share with you soon. The BitCrystals price is the aspect with the lowest satisfaction score. Our strategy doesn’t lie in any direct market price manipulation in order to generate a quick revenue, because we believe rather in the long-term value increase of BitCrystals. While building a solid project around the coin, we will prove its value. We are happy that despite the recent Bitcoin blockchain issues, overall players appreciate our latest feature – blockchainization. It proves that implementing blockchain in gaming was a good choice and we will further work on it. Last but not least, the overall satisfaction with our customer service is rather good, therefore we should keep it this way. Thanks again for your valuable inputs, let’s keep up the good work together!